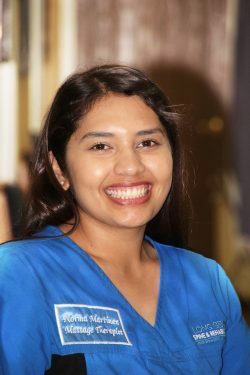 Norma joined the Long Beach Spine & Rehabilitation team as a Massage Therapist in 2017. In 2014, Norma received her C.M.T. licensure in from Everest College in West Los Angeles, CA. Norma completed over 800 hours of education in massage therapy. She holds a certificate from California Massage Therapy Council. She has extensive experience working at various massage practices which has helped her to increase her treatment knowledge and ability to help her clients get the results they are looking for. Norma uses different techniques and stretches treatments depending on the client. Her goal is to help each client feel better and achieve their desired health goals.